For eight years Major General Kostelnik was the face and voice of the DHS drone program. Having retired at year's end in 2012, Kostelnik passed the directorship of the program to Major General Randoph Alles. 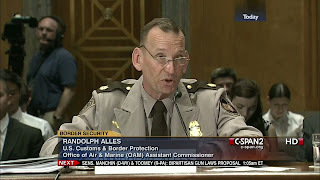 The January 2013 appointment of Randolph Alles to replace Kostelnik underscored DHS' commitment to manage its border control mission within a military framework of national security. The spat that pitted the Air Force against the other armed branches highlighted the Pentagon's mad rush into the age of drone surveillance and warfare. The intensity of the rivalry and the duplication of drone development and acquisitions - which preceded 9/11, but intensified in the following years - underscored the extent to which the Pentagon and the military are too often driven more by competition over funding and weapons systems than by their national security mission. The extent to which this inter-military squabble over the drone budget - one of the few parts of the DOD budget that was increasing, and moreover, rising rapidly - influenced the DHS decision to expand into drone surveillance and to enter into sole-source contracts with General Atomics can at this time only be speculated. As commander of the Marine Corps Warfighting Laboratory, Alles directed Marine planning to "improve expeditionary warfare capabilities across the spectrum of conflict." In his role as Warfighting Laboratory chief, Alles was in charge of the corps' development and acquisition of "various aspects of advanced technologies." In his prepared statement, Alles defended the decision by the Marine Corps to proceed with his own drone development and operational program and objected to the Air Force proposal that it be the "executive agent" for military UAVs. "The Marine Corps opposes the idea that any one service should control the procurement or employment of these valuable assets," said Alles, addressing the Air Force contention that the Army and Marine Corps shouldn't be contracting for research, development, and procurement that the Air Force had already initiated in the mid-1990s with the Predator project of General Atomics. Arguing that "efficiency does not imply effectiveness," Alles told committee members that the Marine Corps needed three tiers of UAVs in varying sizes to be effective at all levels of combat, even though these UAVs may nearly duplicate drones being acquired and deployed by other military branches, particularly the Air Force. The differences between the Predators and Sky Warriors (later renamed Grey Eagles by the Pentagon) are akin to the differences between different models and grades of the Toyota Sienna - featuring the same basic design structure, but differentiated by motor size and the number of Hellfire missiles as part of its "payload." Frustrated by the squabbling over drone funding that set the Air Force against Alles and Navy and Army officials, subcommittee chairman Neil Abercrombie (D-Hawaii) blurted: "Who's in charge? Where is the authority?" More than the prestige of the various military services was at stake then. It's a matter of money, lots of it. In 2013, the Pentagon is set to spend $5.78 billion for research and procurement of unmanned systems, while DHS is moving ahead with hundreds of millions of dollars in contracts with General Atomics and other drone manufacturers. What was true then - about no part of the military or intelligence community being in charge of drone research, procurement, and strategy - remains true. At that time, a Government Accountability Office representative told Abercrombie (currently Hawaii's governor) that no one in the Pentagon was exercising effective control over the competing drone initiatives of the military services - even when these programs involved essentially the same type of drones and the same manufacturer. "This is a longstanding problem in the acquisition process," observed Michael Sullivan, GAO's director of acquisition management issues. "It is the stovepipe nature of our services." Alles dismissed such concerns as being overly driven by efficiency benchmarks. Rather, the primary concern should be: "If we are not effective, then all of the money spent on us is a waste. So I think we have to look at it in those terms and whether in fact we are achieving the effectiveness we want, given that we attain some efficiency." 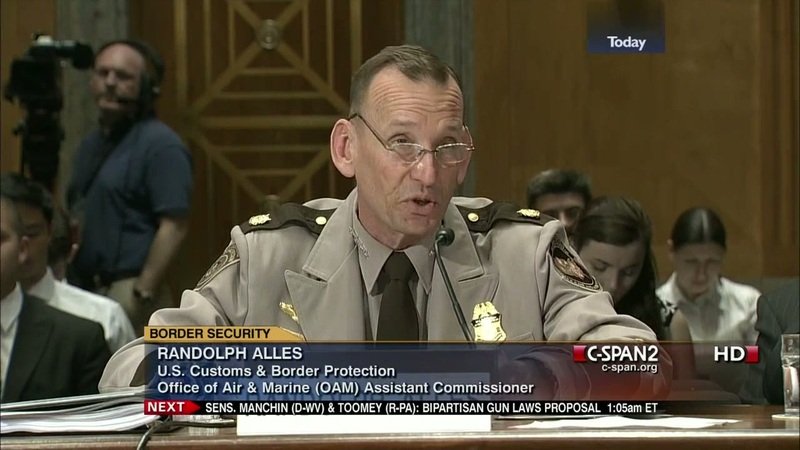 As critics of both DOD and DHS regularly observe, efficiency and mission effectiveness aren't fundamentally counterpoised, which Alles suggested in highly assertive congressional testimony in 2007. Today, both the efficiency and the effectiveness of the DHS border programs, especially its high-tech operations, are being increasingly questioned. As OAM chief, Alles may be obligated to reformulate his earlier argument for increased drone spending, despite questions about inefficiency and waste resulting from duplicative programs. A highly critical May 2012 report by the GAO, titled "Border Security: Opportunities Exist for More Effective Use of DHS's Air and Marine Assets," took OAM to task for both its effectiveness and efficiency - as well as lambasting the agency for it egregious failure to have performance measures in place.